Clemson University head football coach Dabo Swinney was in a preaching mood following the Tigers’ 44–16 victory against the No. 1-ranked University of Alabama in the College Football Playoff National Championship Game Monday night in Santa Clara, California. Following what was his team’s second national championship victory in three years, the 49-year-old didn’t mince words about who he thought was responsible for the blowout victory against his alma mater. Although freshman quarterback Trevor Lawrence picked apart the Crimson Tide defense on his way to 347 passing yards, three touchdowns and no interceptions, Swinney believes God was responsible for orchestrating the Tigers abundant success this season. Swinney went on to assert that “no Hollywood producer” could write the script that the Tigers faced as they became the first 15-0 team in college football history. Clemson tackled a similar mountain in 2017 when the 14-1 Tigers previously defeated the 14-1 Crimson Tide in that year’s national championship game. Swinney was also asked in his post-game interview about how he describes the “joy” he felt in the moment. Swinney is an unashamed Christian. Before of the season last July, he opened up about his Christian faith during a press conference and explained that he was brought up by his parents who taught him about God. But Swinney explained that it wasn’t until he was 16 years old that he came to Christ. As the Billy Graham Evangelistic Association’s Decision magazine points out, Swinney was left without a coaching job for nearly two years when he was in his early 30s during the early 2000s after an eight-year stint as an assistant coach at Alabama. Swinney said he regularly prayed to God about the situation in which he expressed his strong desire to coach again but also kept his mind open for the Lord’s will to be done. 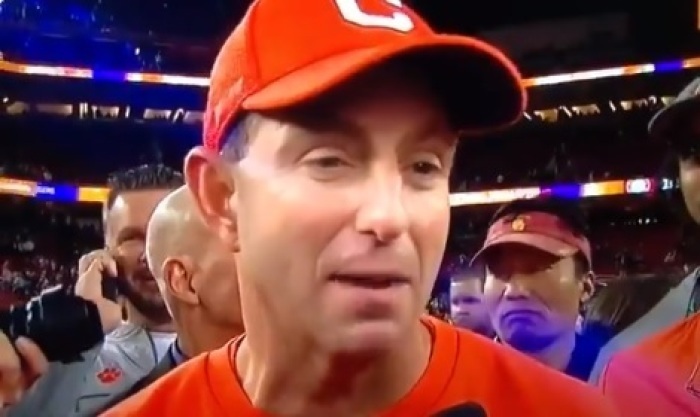 Swinney, for a time, found himself working as a shopping center leasing agent until he was hired by the South Carolina-based Clemson to be the wide receivers coach in 2003. Six years later, Swinney would become the Tigers head coach. He has transformed the Clemson football team from being a team known for losing winnable games to one that has now won two national championships in three years and is now on the verge of surpassing Alabama as the gold standard in college football. Swinney is far from being the only strong Christian in the Clemson locker room, as is quarterback standout Trevor Lawrence. Last September, Lawrence explained that his faith is the “biggest thing” in his life. “I just know that no matter how big the situation is, it's not really going to define me,” he added. As the 19-year-old Lawrence has had to deal with the high expectations that come with being one of the top quarterback recruits in the nation, he asserted that “it doesn’t really matter” what people think about him or the way he's playing. Lawrence explained that he puts his “identity in what Christ says” and on who God thinks he is and on what he knows God says he is. “That has definitely been a big thing for me just in my situation knowing that and having confidence in that,” Lawrence said.